Last year we detailed 10 Columbus dishes to try, and now we’re here to suggest 10 more. If you’ve never had these signature Columbus eats, it’s time to explore! 1. Salty Caramel ice cream at Jeni’s You could say Jeni’s ice cream is one of Columbus’ chief exports. The hometown ice cream shop has expanded to grocery stores and cities across the country with their flavor-packed treats built from quality ingredients. The signature flavor is the salty caramel, because Columbus loves the mix of sweet and salty! 2. 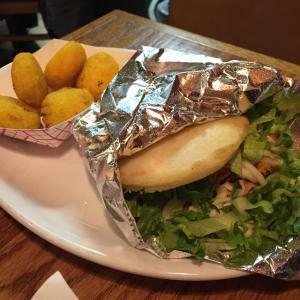 Arepa at El Arepazo This Latin American favorite has blossomed to two locations – Brewery District and Gahanna – and their signature is the arepa, a Venezuelan dish of a corn cake sliced in half and filled with shredded meat, cheese, and vegetables. You can also order a side of tiny arepitas, and be sure to get their cilantro sauce for dipping! 3. Thurmanator at Thurman Cafe The gigantic Thurmanator consistently shows up on the national radar as a Columbus favorite. Is it the best burger in town? Maybe not. Is it over-the-top and fun to eat? Absolutely! The Thurmanator is built from two 12-ounce patties topped with, well, everything else! Don’t want to wait for your burger? The German Village location has a to-go section. You can also order burgers to-go from their new Reynoldsburg hub, or find the Son of Thurman cafe in Delaware. 4. IPA from Columbus Brewing Company It’s not a dish, but considering how beer in Columbus is booming, you’d be missing out if you didn’t sample at least one local brew. Columbus seems to be an India Pale Ale town, and one of our signatures is Columbus Brewing Company’s IPA. The hoppy brew is a perfect on its own or as a complement to any meal! 5. 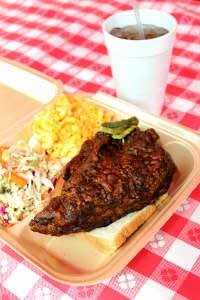 Hot chicken from Hot Chicken Takeover Columbus is having a love affair with fried chicken right now, whether it’s Memphis-style from Double Comfort, Low Country-style from Mya’s – or one of the biggies: Nashville-style hot chicken from Hot Chicken Takeover. HCT has grown rapidly from an Olde Towne East pop-up to a mainstay at North Market and a food truck. The spicy chicken is coated in a fiery cayenne pepper paste that keeps customers coming back for more. 6. Pho at Huong Vietnamese Columbus has no shortage of great Vietnamese restaurants these days, and the pho at Huong stands out from the group. Pho is a hot noodle soup usually built on a complex beef stock that’s simmered for hours, if not days. It’s healthy, filling, and heart-warming. Huong’s pho is a good gateway to Vietnamese dining around the city. 7. Chilaquiles at Starliner Diner Regularly voted one of Columbus’ favorite breakfasts, this Hilliard diner draws steady crowds for their Latin and southwestern fare. Huevos rancheros, Cuban French toast, chorizo omelets, breakfast burritos – all good reasons to get up early! The chilaquiles are made from black beans and sautéed veggies scrambled with eggs, cheese, and tortilla chips. 8. 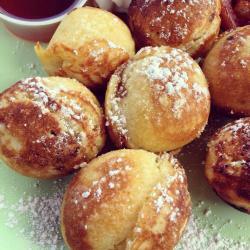 Pancake balls at Katalina’s Pancake balls are the quirkiest dish in this quirky Harrison West cafe. Pancake batter gets molded into ball form in special pans, and then filled with goodies like Nutella, apple butter, or ham and cheese. They’re a perfect sweet treat, although you can’t miss ordering a side of sweet and spicy bacon, too! 9. Ohioana dog from Dirty Frank’s Hot Dog Palace Dirty Frank’s has taken a traditional comfort food – hot dogs – and put a fun spin on it. These hot dogs are meant for more than just ketchup and mustard. Try ingredients like jalapenos, crushed chips, baked beans, Sriracha cream cheese, brisket, French fries, or tater tots! The Ohioana is covered with a zesty corn relish and celery salt. 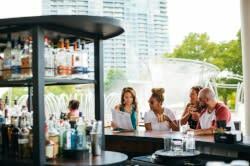 Both locations – downtown and Westgate – supplement the fun with craft beers, mac and cheese, tater tots, and slushies. 10. Glazed sour cream donuts from DK Diner Every corner of Columbus boasts excellent donuts, from the old Jolly Pirate shops on the south and east sides, to Resch’s Bakery on Livingston, Schneider’s in Westerville, Honey Dip in Upper Arlington, and Buckeye Donuts near campus. Grandview’s DK Diner crafts hand-made donuts that are dense, fresh, and always worth the trip. DK also serves a great diner menu, and you can’t eat in Columbus without trying at least one diner. What are some of your favorite Columbus dishes?